We’re thrilled to share the news about Down the Road Beer Company’s newest addition to the company’s session beer lineup brewed at Dorchester Brewing Company! 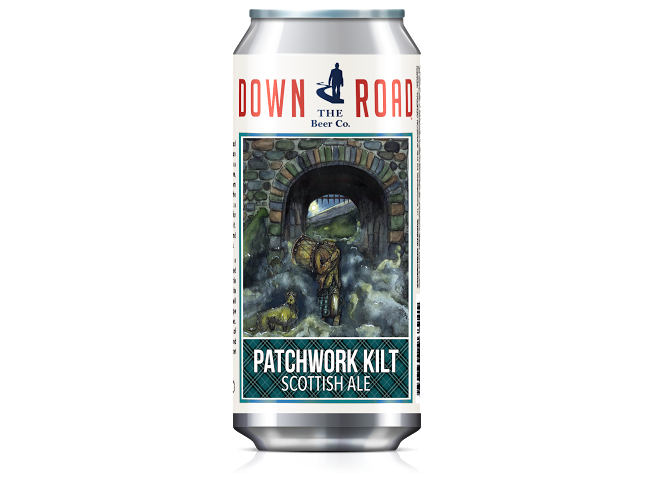 Down The Road Beer Company is pleased to announce the Patchwork Kilt Scottish Ale, the newest addition to the company’s session beer lineup. This malt-forward beer is hauntingly complex with deep, rustic notes of dried fruit and fresh honey. Patchwork Kilt clocks in at 4.5% ABV, the perfect balance for taking the edge off without losing your wits. This Ale pours a dark copper with a creamy head. The nose is thick and almost bready with a faint hint of currants. On the palate, Kilt is smooth, almost silky, with a delicate, honeyed sweetness that gives way to roasty malt and a homely smokiness. Each beer from Down The Road draws on a character from folklore often with an emphasis on the region from which the brew originates. The Patchwork Kilt is an homage to the Headless Drummer of Edinburgh Castle, a protective spirit that strikes fear into the hearts of intruders, villains and blaggards who would threaten the ancient stronghold of the Scots. The Patchwork Kilt was brewed under contract at Dorchester Brewing Company in Dorchester, MA. This is the first beer Down The Road has brewed at Dorchester Brewing Company, Boston’s first and only dedicated partnership brewing facility. In response to strong customer demand for its Fresh, Local and Inspired beer, Down The Road will be opening its own Taproom and Brewery in Everett, MA in early 2017 and is also expanding its contract brewing relationships. The company hopes to brew additional styles at Dorchester Brewing Company later this year while maintaining its existing brewing relationships. Down The Road will be the first Brewing Partner for Dorchester Brewing which opened in July 2016.